On Thursday, a day that I didn’t have to be at work until noon, I, of course, got up early and took a stroll through Forest Park. Well, I didn’t really so much as take a stroll through Forest Park as I took a stroll to the water hole in Forest Park and sat and looked at the birds. Then I strolled to the area with some bird feeders and sat and looked at the birds. And then I strolled back to the water hole and sat and looked at the birds. And then I strolled home. 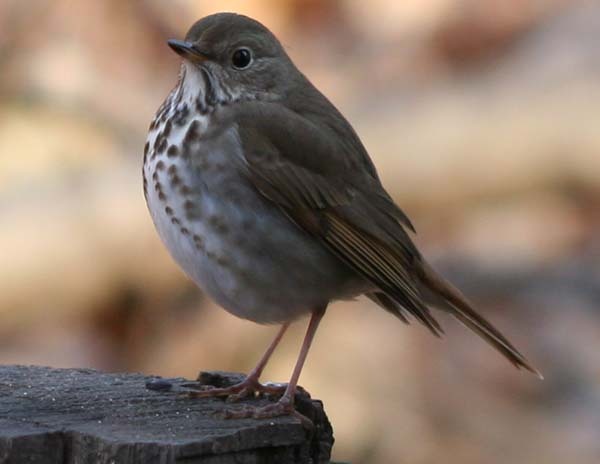 The birds were highlighted by my first of the year Chipping Sparrow, a gorgeous male Pine Warbler coming to the small platform feeder, and a very cooperative Hermit Thrush that foraged in the leaf litter two meters in front of me off and on for about fifteen minutes. 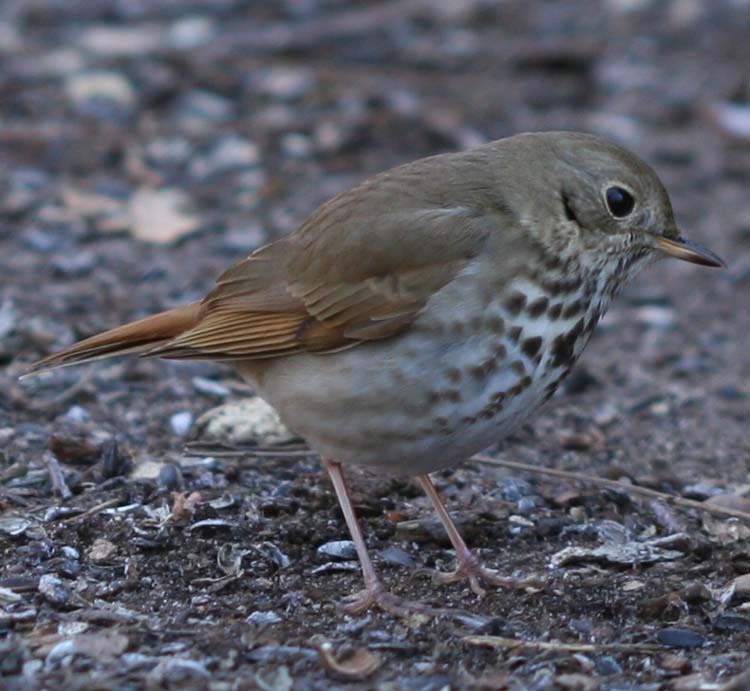 And I thought the Hermit Thrush last week would be as good a look as I would get at a Hermit Thrush for quite some time to come! 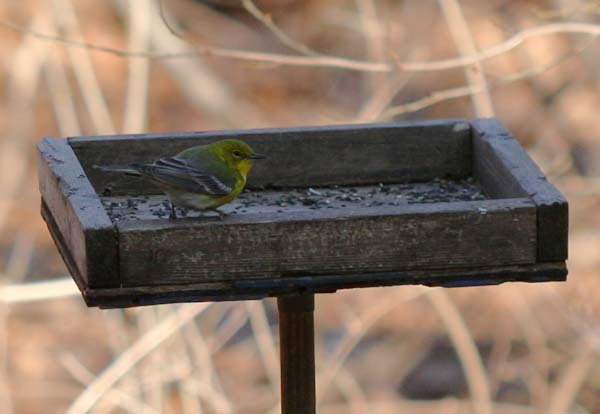 And, as a special bonus to go with this Hermit Thrush post, the Pine Warbler. 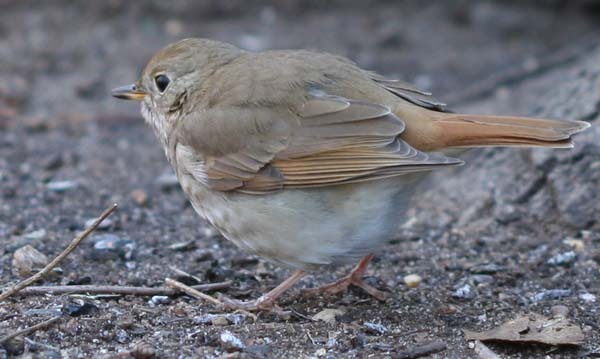 This post was first published in April of 2008 but a Hermit Thrush like this is too cool to keep hidden in the archives! 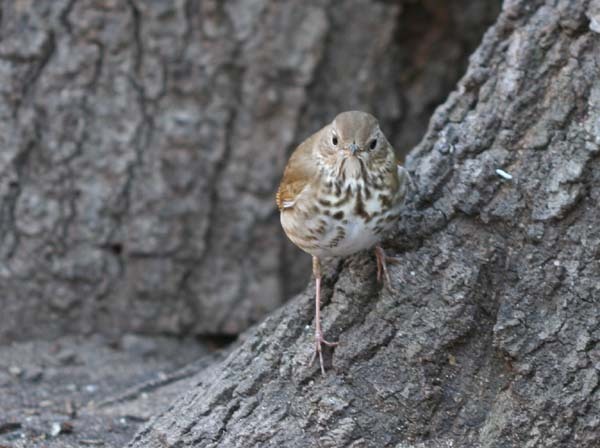 Birding in NYC is like birding at the zoo! You get spectacular views at times because the birds are crammed into a few scraps of habitat. Can’t wait to do some NYC warbler birding very soon! How great, I have yet to see a Pine Warbler or Hermit Thrush! Stunning photos! Man, Corey you have all the luck. I haven’t seen a Hermit Thrush or Pine Warbler this year, all I’ve had to look at the last few days are boring old Snail Kites. Oh well. 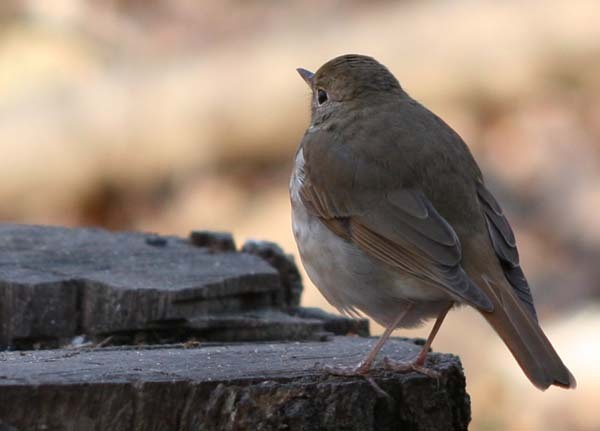 Your pictures of the Hermit Thrush are great. I haven’t seen one in a while. I often find this time of the year the most exciting as the birds migrate and you see long lost friends…. @Will: I am sooooo jealous. @Michael: Thanks, and nothing beats migration! Love your post, you’re on my blogroll nature favorites list. 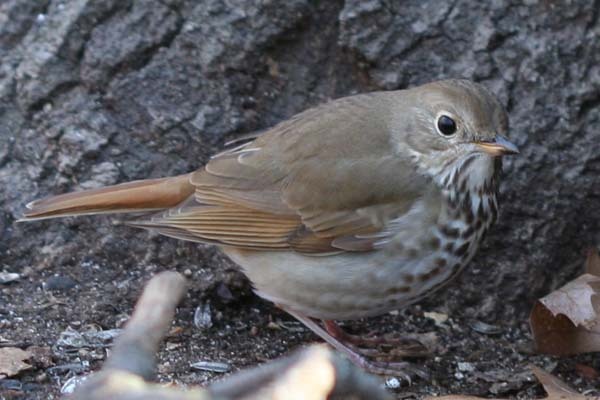 We just saw out fos Hermit thrush at the Ft. Worth Nature Refuge last weekend. It was great to see an old friend return. @Troy: Thanks and a Texas-sized welcome to you!